Tech giant Amazon will build an East Coast headquarters in Long Island City, bringing 25,000 new jobs and millions of dollars of capital investment to the Queens neighborhood. The Seattle-based company announced Tuesday that it intends to lease 1 million s/f of office space inside One Court Square, the emerald tower emblazoned with the Citi Bank logo, while it builds a 4 million s/f headquarters elsewhere in the neighborhood. It will bring 700 jobs to the area next year and ramp up its workforce incrementally. Amazon will partner with TF Cornerstone, one of the neighborhood’s most prominent developers, to construct its new waterfront headquarters. 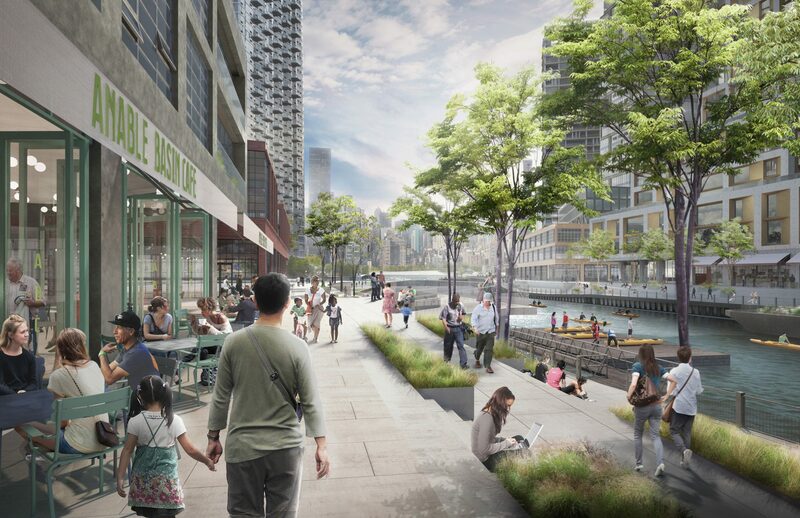 The campus will be built around the Anable Basin, a former industrial inlet on the Long Island City waterfront offered up as a special mixed-use district last year. To land the company, New York State agreed to give it more than $1.5 billion in tax breaks. Amazon is targeting one of the last remaining industrial areas on Long Island City’s waterfront for its new headquarters. The area, called the Anable Basin, was proposed as a special development district last year. Amazon’s arrival is expected to bring increased interest to the rising Queens district, both from companies and real estate investors. It’s also expected to help the area’s housing market, which is flushed with luxury rentals and condos, and attract more retailers. It’s also raising concerns about overloading an already overburdened area and the state’s willingness to dish out lucrative tax incentives to one of the wealthiest companies in the world. Speculation about Amazon’s plans for Long Island City has swirled for the past week since the first reports emerged that it chose New York and Arlington, Virginia to split the duty of its “HQ2” location. On Tuesday, the company also announced a new operations office in Nashville as part of its eastward expansion. The thought of Amazon putting down roots in the Big Apple has raised spirits in the business community and brought hope to Long Island City locals who believe the company’s arrival could bring much-need infrastructure investment. To that end, the city has negotiated a payment in lieu of taxes, or PILOT, program that will reroute the company’s property taxes to direct investments including a new school, a tech incubator, parks and other community spaces. Amazon has promised to bring 25,000 jobs to the area with an average salary of $150,000, though a company spokesman declined to say what the median pay would be or how salaries would be distributed. In Metro New York, the average salary for a software developer is $117,620, according to the U.S. Bureau of Labor Statistics, while the median pay is $68,480. It’s also unclear how many high-paying executive positions will be created at the site, dragging up the average. The state is offering Amazon $1.2 billion in refundable tax credits over the next 10 years for its employees, with the funds for that coming out of the New York State Excelsior Program, which covers tuition at SUNY and CUNY schools for New York state residents. Empire State Development is kicking in a $325 million cash grant, as well. The company also plans to take advantage of New York City’s Industrial & Commercial Abatement Program, or ICAP, and its Relocation and Employment Assistance Program, also known as REAP, which provide tax breaks to any company that relocates to an outer borough. Amazon estimates that it will account for $2.5 million of area investment while generating $10 billion of state tax revenue during the next 20 years. Although New York’s concessions to land the tech giant might seem overly generous, especially compared to Virginia, which has agreed to a benefits package one-third the size of New York’s, Heidi Learner, chief economist at Savills Studley, said the Empire State did get some assurances in return. In addition to the PILOT payments, the company has promised to make neighborhood improvements based on community input. Also, its gradual ramp-up of employment should prevent the area from being inundated with new residents, she added. Amazon will bring 25,000 new jobs to Long Island City in the coming years. Jonathan Eshaghian, an investment sales agent with Marcus & Millichap, said he expects Amazon’s commitment to Queens to have ripple effects not only in Long Island City but also in surrounding areas such as Astoria, Sunnyside and all the way along the 7 train line to Flushing. Eshaghian also predicts that economic investment in Long Island City will soon break away from its core area—which includes the Hunter’s Point waterfront, Court Square and Queens Plaza—to areas further to the north, including the Dutch Kills neighborhood. With several recently built hotels and numerous commercial properties one stop from the Cornell Tech’s campus on Roosevelt Island, he said northern Long Island City will likely be the next target area for investors. “[Amazon] is going to be a catalyst for the continued growth that we’ve seen here for the past 10 years,” he said.